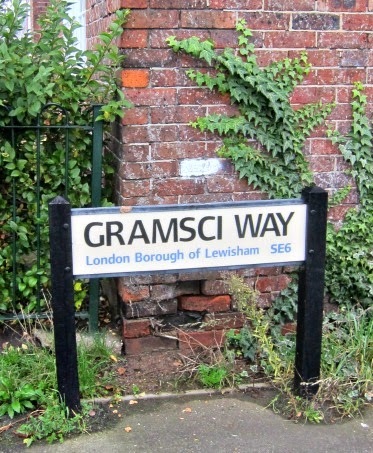 There aren't too many streets in London named after Italian communists, but in Bellingham SE6 there is a little slice of Lewisham dedicated to Antonio Gramsci (1891-1937), who died following eight years in jail as a prisoner of Mussolini. 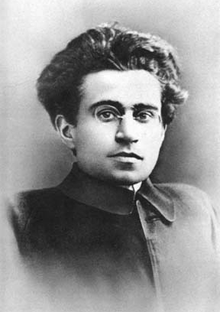 Gramsci Way is a cul-de-sac off Randlesdown Road. I understand that 'Red Rector' Father Paul Butler, now of St Pauls Church in Deptford, was instrumental in getting the road so-named when he was Vicar at St Dunstans in Bellingham - the vicarage of which is in Gramsci Way. Any other ideas for Italian communist street names - Malatesta Mansions perhaps, or Bordiga Boulevard? Thanks, I had often wondered whether and why there was a linkage - it is a road I quite often pass. Thank you for the story behind the name. It always makes me smile to think of Gramsci commemorated here, and I used to wonder how the road got its name. I thought perhaps a radical town planner sneaked it past a dozing committee. Somehow the modesty of the road is appropriate to the man - even as he transports the mind far from prison/Bellingham/the present political system.